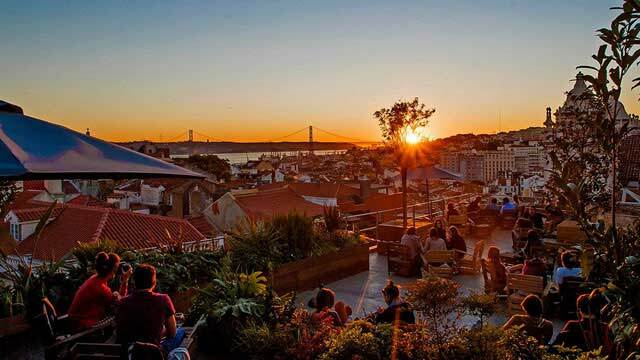 A complete guide to the 14 best rooftop bars in Lisbon in 2019. Search through 14 rooftops with all info you need about each place. Opening hours, dress code, pictures, maps and much more. 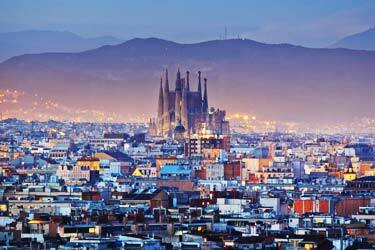 One of Europe’s best rooftop cities. The warm climate, luxurious hotels and genuine restaurants makes this a perfect destination if you like to eat and drink with a view. Both city and ocean views will blow your mind at these spectacular venues. 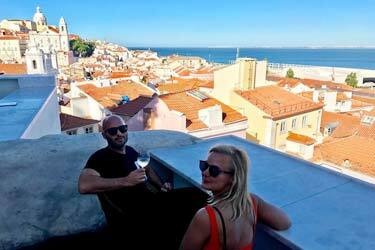 So, which is the best rooftop bar in Lisbon? 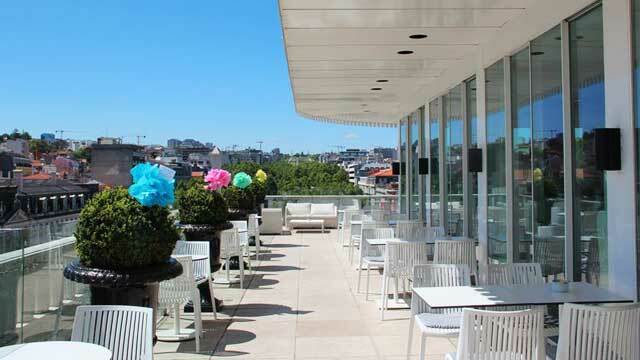 Scroll down on the list and find the Lisboa rooftop bar best suited for you. Or use the Lisbon rooftop map in the bottom right corner. 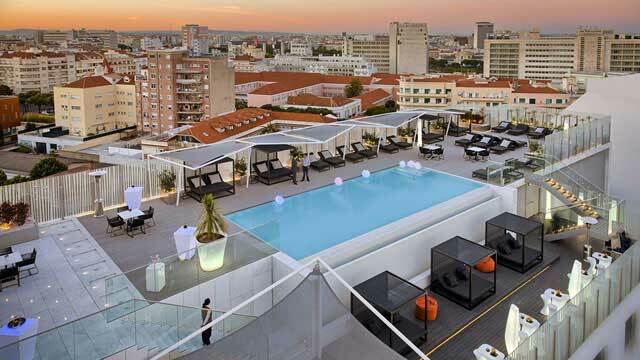 Park is a trendy rooftop bar in Lisbon located on the 6th floor of a parking garage. Not the easiest place to find, but as a reward, you will get a roof terrace with one of Lisbon's best views, and a sunset that is absolutely breathtaking. The terrace is lush and cozy decorated with wooden furniture and plants, and offers a large set of classic cocktails at good prices, along with the usual selection of beers and wines, sangria and some bar bites for the hungry ones. Very popular place that don't take reservations, so be in god time to have a chance at getting the best spots. A versatile rooftop, offering both a clubbing and a dining experience. And as a side, amazing 270-degree views over Lisbon and the ocean. The trendy and stylish terrace is located in the heart of Chiado, decorated in a classic lounge style with large comfortable sofas. Choose between a wide selection of fresh Japanese dishes, tasty and well made cocktails, along with fine selections of wine, champagne and spirits. Always a luxurious and sophisticated atmosphere, a perfect spot for early night sunset cocktails (from 7pm) or a fine rooftop dinner, and after midnight the mood transform towards the clubbing experience. 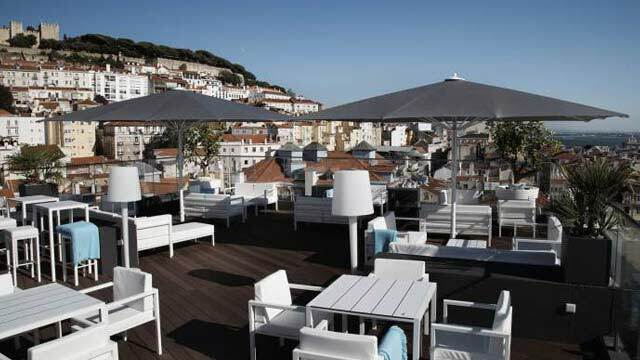 Memmo Príncipe Real has one of the best and newest roof terraces in Lisbon, called Cafe Principe Real. 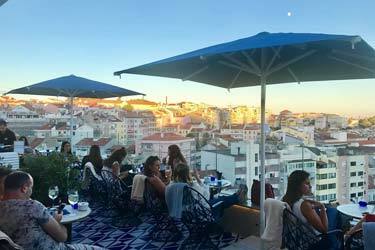 This elegant and modern rooftop is located in Bairro Alto, and can boost with both a restaurant and a cocktail bar. And, if you stay at the hotel, a fantastic rooftop pool. The restaurant offers a menu towards fine dining, with both small and large Portugese and International dishes, and the bar has an extensive list of well crafted cocktails, from classics to new creations with a Portugese touch. Expect a trendy and sophisticated atmosphere along with great and friendly service. 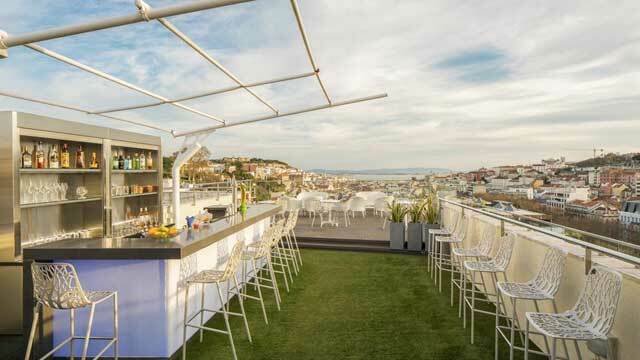 On top of the Hotel Tivoli, right in the center of Lisbon, you find Sky Bar Lisbon, a modern and chic rooftop bar. The terrace offers panoramic views of the city, from downtown all the way out to the river, and a cool layout, set over different levels and with different options of seating, like comfy lounge sofas or bar stools right at the edge. From the bar you can choose from an impressive set of well-made crafted cocktails, beer on draught, champagne and sparkling by the glass or in bottle, and food perfect to share. Enjoy live acts & DJs in an ambience towards sophisticated and trendy lounge, but still relaxed. 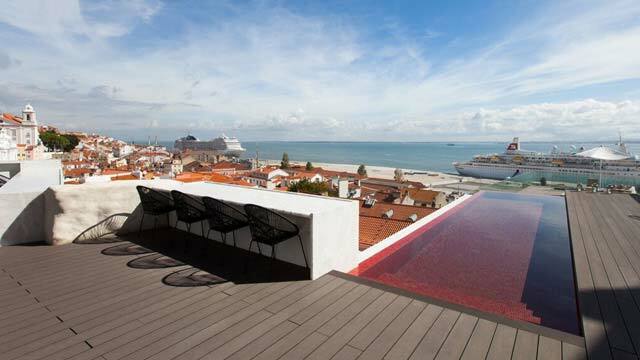 Red pools and dazzling views, you find it all on our list of the best rooftop pools in Lisbon. So dive in and find your 'must visit' places in Lisbon! The rooftop bar on the 9th floor of Hotel Mundial is somewhat of a hidden gem, but also a favourite among the Lisbon locals. With a location in the heart of the city, close up views of Castelo de São Jorge and panoramic 360 visats of Lisbon all the way to Tejo River, it is easy to understand why. The terrace has a modern and trendy feel, both regarding atmosphere and decor, with white lounge chairs and bar stools, often occupied by people enjoying the sunset socialising to the beat of some nice lounge music. From the bar you can get a variety of tasty cocktails, or nibble on some Portuguese tapas. 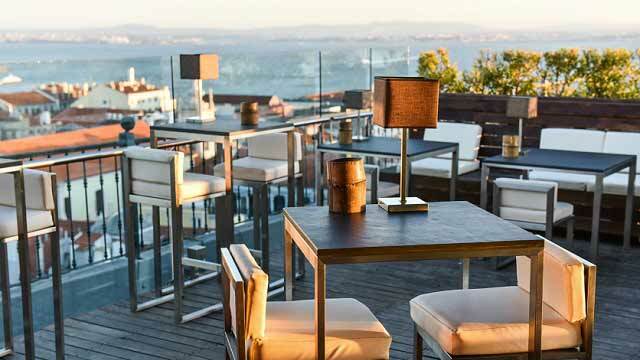 Stylish, yet comfortably and cozy furnished Entretantos rooftop bar offers spectacular views over the city of Lisbon. This is an ideal place for relaxation after, or in between, long hours of sightseeing or shopping. Have a seat at one of the tables under an umbrella, or get really comfy in a lounger out on the green lawn. The bar offers a large menu with well made classic cocktails, 12 different Gin & Tonics, sangria, wines, Five o'clock tea and both lunch and dinner from an á la carte menu. There is something for everyone, and opening already at noon, this is a perfect place for some long afternoon cocktails. Limão Chill-Out Terrace really brings the beach and summer vibe right to the city, with its blue and white tile floor, a white bar and stylish and modern lounge furniture. Located on the 10th floor of the luxurious H10 Duque de Louléis, the rooftop offers a fantastic panoramic view over Lisbon city and the sea. With both indoor seating and a small but very cosy outdoor terrace, this is one of the most romantic rooftop bars Lisbon has to offer. Enjoy classic cocktails, bubbles, wines and some really fresh and tasty Portuguese tapas, in a relaxing and harmonious atmosphere, with a great and friendly service. 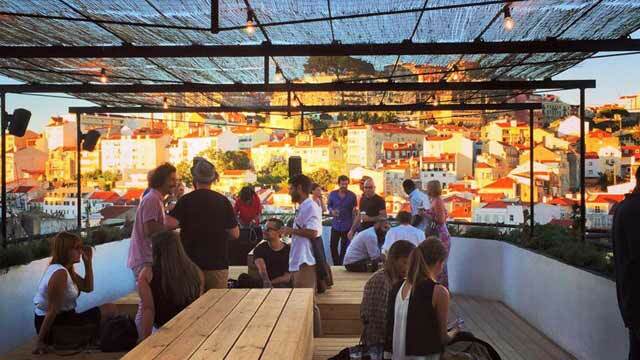 Topo is a chic, trendy and unpretentious place among the Lisbon rooftop bars, located on the 6th floor of a multiethnic commercial center, right next to Martim Moniz Plaza. Up here you get lovely views over the city, a glass-hut indoor space and an outdoor terrace with multi-level wooden boxes working as seating areas. Both a rooftop restaurant and bar, Topo is mainly known for their premium cocktails, but also serve food of very good class. A very popular place, so for dinner, reservations are highly recommended. For a visit at the bar, just show up and enjoy the trendy crowd and the vibrant atmosphere. Upscale Bar is a stunning oasis in the modern part of the city, with a stylish and cosmopolitan atmosphere. 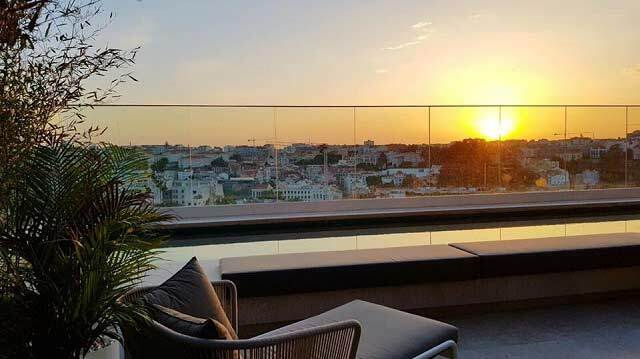 Located on both the 8th and 9th floor of the luxurious hotel EPIC SANA Lisboa, the roof terrace offers a superb view of the Tagus River, Lisbon's rooftops and the skyline. The best feature of the terrace is the 9th floor luxurious infinity pool, one of the best Lisbon rooftop pools, unfortunately exclusive to hotel guest. But, luckily enough, one floor down you find Upscale Bar, open for everyone daily between May to September. Here you can enjoy an extensive selction of drinks and a good selection of various food. 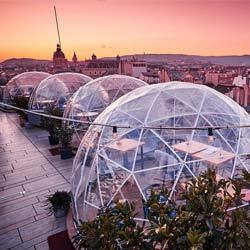 This elegant rooftop bar and restaurant, with a large and spacious roof terrace (open in summer), is located on top of hotel Altis Avenida, close to Rossio Square. From up here you get a fantastic view across Avenida da Liberdade and all over the Lisbon rooftops. Open from 07 in the morning to 01 at night, this is really an all hours rooftop where you can enjoy breakfast, lunch, a romantic dinner or just some cocktails on the terrace. The restaurant serves great Mediterranean and European dishes in fine dining style, while the rooftop bar offers a range of both classic cocktails and a variety of beers and wines. And all of this comes with a fantastic service. 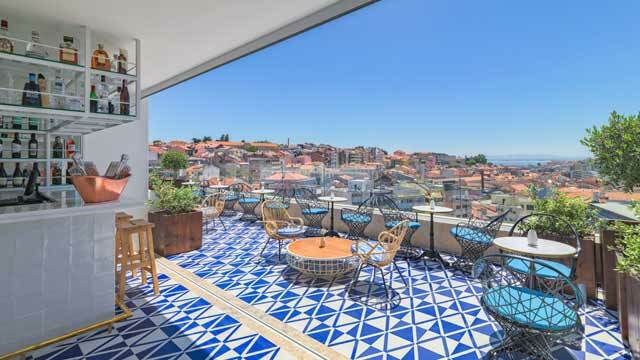 The Bairro Alto Hotel Terrace is a rooftop bar offering wonderful views of the Atlantic Ocean and Lisbon's surroundings. The sunset here is absolutely fantastic. From the bar you can order cocktails, champagne and coffee and from the restaurant they serve light meals, all in a very pleasant and relaxing atmosphere. Situated on the top floor of newly renovated NH Collection Lisboa Liberdade, you find this roof terrace called Àtico by NH. The best and most distinguished feature up here is definitely the lovely rooftop swimming pool, open for hotel gusets but also available to non-guests for a fee. At the other end of the terrace you find an open and airy wooden deck, with stylish lounge furniture and most of all, a breathtaking 360 view over Lisbon. Open daily during summer, the rooftop bar offers tasty Portuguese bar bites, along with a large set mixologist cocktails, wine by the glass or beer on draught. If you are looking for the best views over the Tagus river, look no further. Memmo Alfama Terrace, located right in the heart of the buzzing Alfama district, is a rooftop bar with breathtaking views of the river, the Alfama rooftop and the beach. The terrace is equipped with a luxurious (and red) rooftop pool, one of the coolest in town, and while it's only available to use by hotel guests, it definitely gives an extra touch to the elegant white marble terrace, which is open to everyone. The rooftop bar offers an extensive wine list, a nice cocktail menu and a selection of Portuguese tapas, all in a quiet and relaxed atmosphere. I'm in Eden is a large and spacious rooftop bar in Lisbon, located on top of the VIP Executive Éden Aparthotel, close to the famous Rossio Square. Decorated in a quite simple and minimalistic style, the rooftop offers a great pool for hotel guests to enjoy during daytime, while at night it is open to all. 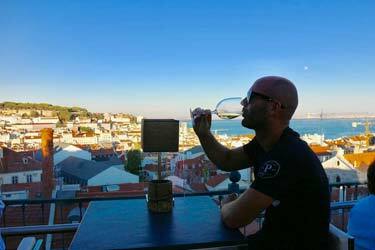 Not the fanciest rooftop in the city, but with breathtaking views all the way to the water, it is well woth a visit to enjoy a beer or a glass of wine in a calm setting, gazing out over Lisbon. Discover the biggest collection of Lisbon activities, guided tours and skip-the-line tickets. Anything you want you'll find right here. 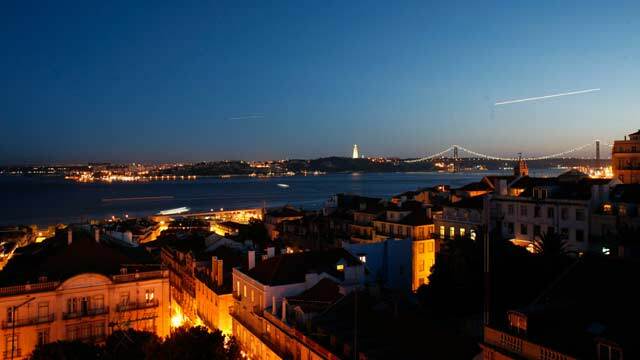 Which are the best rooftops in Lisbon? Lisbon is one of the best cities in Europe, when speaking of places to drink with a view at. Everything from cozy rooftop bars to luxurious terraces with pool and magical views over the city and the sea. 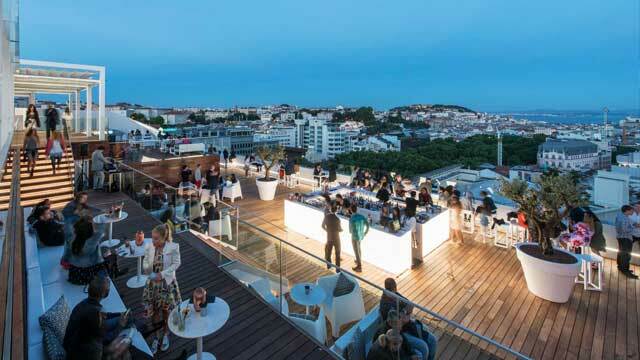 In Lisbon, there is something for everyone regarding rooftop bars. 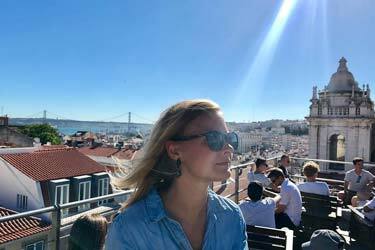 Overlooking the Atlantic Sea, sitting in a lounge chair and a glass of port wine in your hand is the ultimate experience on a rooftop bar in Lisbon. The Lisbon rooftop bars is quite spread out over large areas of the city. Some are down by the seaside, few within the city center and some perched on the hill overlooking the entire city and its surroundings. To get between all these amazing places, its walking distance from some roof terraces while you have to go by taxi to others. There are a lot of good roof terraces in Lisbon. Due to the mild and pleasant climate the rooftop bars here can stay open almost the whole year around. 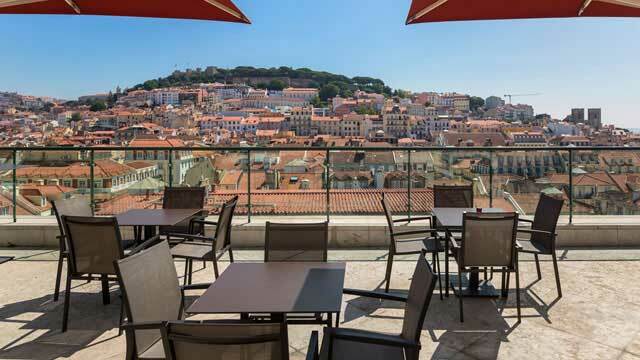 The typical Lisbon roof terrace has superb views with great food and service. Lisbon is Portugal's largest city and also the capital city. The city is located at the Atlantic coast which gives a lovely climate and good opportunities for swimming and sunbathing. Here you can find a bunch of famous museums with some of the world's most coveted artworks. The city is built on hills, which means that some streets are even too steep to drive vehicle’s on. Here you can also find the Monsanto park which is one of the world's largest urban parks with an area of almost 10,000 square kilometers. 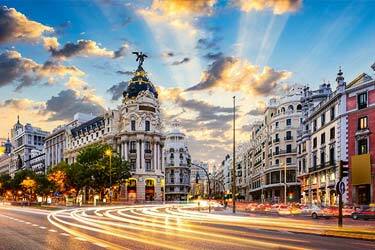 Portugal is not as famous for its food as their neighbors Spain, France and Italy. But here are absolutely fantastic seafood here, often caught the same day by one of the fishing boats in the harbor. On the roof terraces in Lisbon you usually drink beer, classic cocktails or wine. Quite the same as on many other rooftop bars in the world. Is there any drink one associates with Portugal, it’s the port wine, but it is more common in the neighboring city of Porto. Regarding party on rooftop bars in Lisbon there are some places that have a really nice atmosphere. Often the party starts already in the afternoon and continues into the night. 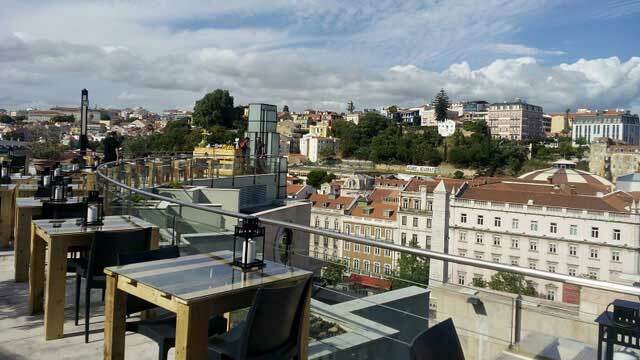 Many of Lisbon’s rooftop bars are located at a high altitude. The city is built on very uneven ground makes many of roof terraces in Lisbon ends up on the hill which gives a great view and overview. The view can be quite magical from many roof terraces here. Or what about the views of the Atlantic, the beach and Lisbon's rooftops. For those who like sunsets, this is paradise. From many rooftop bars in Lisbon you get quite superb sunsets over the Atlantic. This turns the sky and the horizon into a magical spectacle of color. 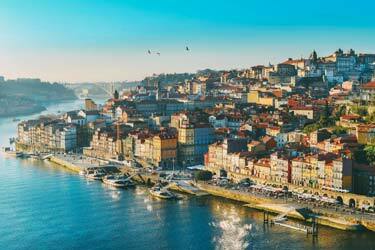 Lisbon is not as well known for attractions such as Rome, New York, London or Paris. But there's still a lot you should experience when you go here. Or how about the city's highest point, dating back to the time before Christ, the Castelo de Sao Jorge, or the magnificent defense facility Torre de Belém, the pompous monastery and burial place Mosteiro dos Jeronimos, Portugal's National Museum, National Museum of Ancient Art and the famous iron lift Elevador de Santa Justa, designed by Gustave Eiffel. That said - Lisbon is a city with much history and beautiful places. Regarding sports, there is a well-known football team named Sporting Lisbon, one of Europe's most famous soccer teams. Despite its warm climate and beautiful location on the Atlantic Ocean, there are not that many rooftop swimming pools in Lisbon. However, there are a few that are really good. As usual, only hotel guests may use the rooftop pools here. So do not miss to book your stay at a hotel with a rooftop pool with us and take part of this luxury, as all too many are missing out on their city trips. 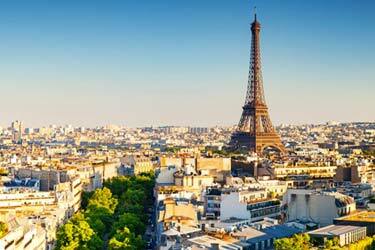 Here you also get the best prices on hotel rooms. 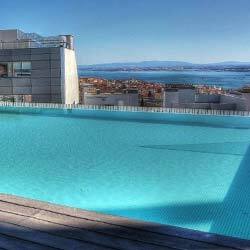 To bathe in the rooftop pool while gazing out over Lisbon with a drink in hand is something you should experience when you are here.